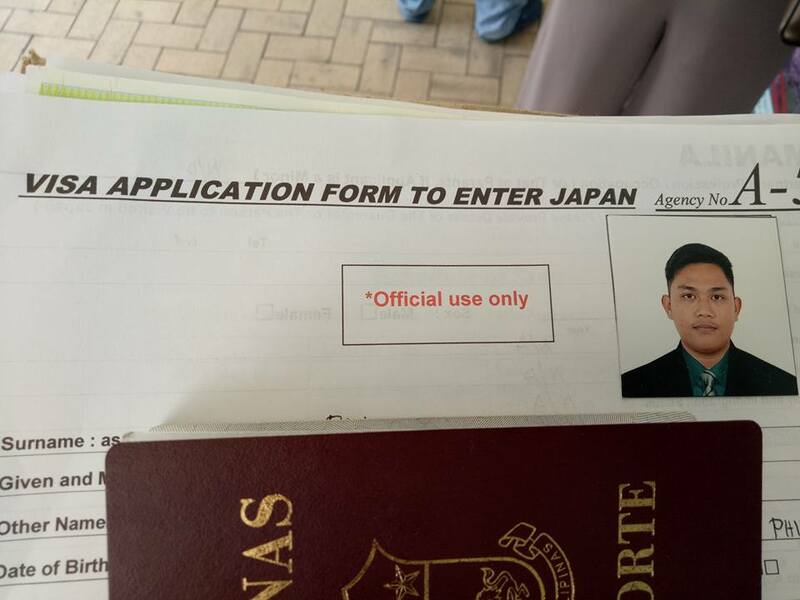 Here's the requirement base on the Embassy of Japan website. >Broken passport is not accepted. Passports must be signed and must have at least two (2) blank visa pages. > Available at the Embassy website, at the entrance of the Embassy or at any of the accredited travel agencies. > Application form should be filled out all items correctly, If item is not applicable, please fill in [N/A]. Embassy may not accept application with blank item, no signature or no date in the form; may deny the application that is filled out incorrectly or wrong information. > Specs: 4.5cm x 4.5cm, with white background. > It must be issued within one year from PSA Main Office/Serbilis Outlet Center (Nationwide). >If the birth certificate from Philippine Statistics Office (PSA) is unreadable, or has incomplete information, please submit the birth certificate issued by PSA together with a birth certificate issued by the Local Civil Registrar. > If the birth certificate is “late registration”, please submit in addition, a baptismal certificate and school record (Form 137) from high school or elementary and School Yearbook (if possible). > If there is no record in PSA, please submit a “Certificate of Non-Record” from PSA together with a birth certificate from the Local Civil Registrar. I was so excited and a little bit nervous since I don't have a history of traveling out of the country. 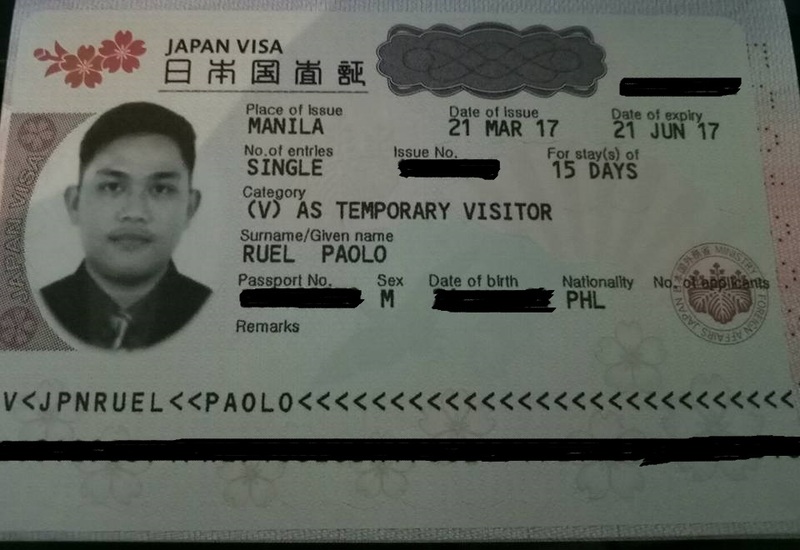 I gathered all the requirements needed and secure it before I fly to manila. 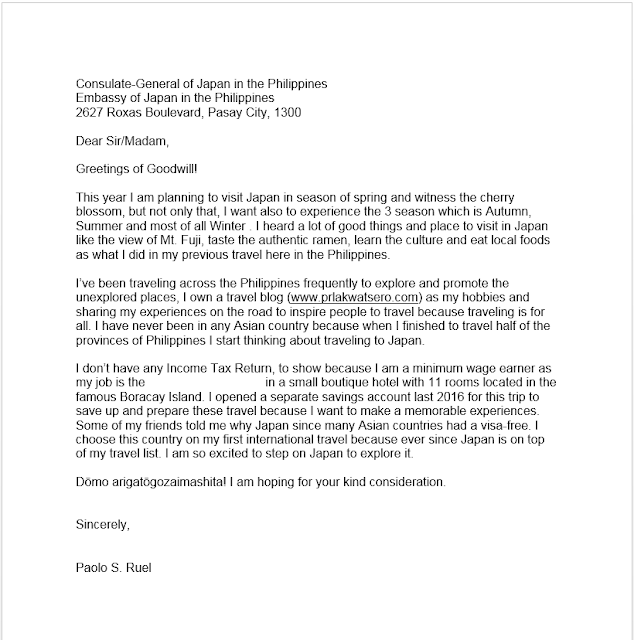 I processed my application on my last day in manila before flying back to the Island of Boracay. 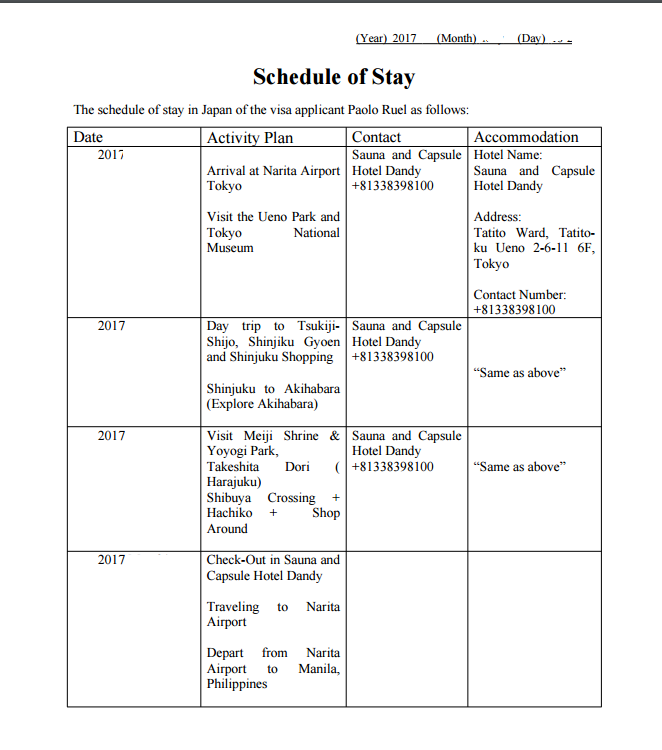 Here's the requirements I submit in Reli Tours and Travel - Mall of Asia Branch. > Certificate of Employment - stated my position in the company and date hired. > Application Form - You can fill-up online here and print it out, if you don't trust your penmanship like me hehehe, but make sure to print it at A4 size because the agency is very strict it comes in the paper size. I got mistaken, I print it on a short size bond paper and the agency, ask me to make a new one in hand writing, MayGad hehehe but I tried and do it slowly to make my application form neat and clean. 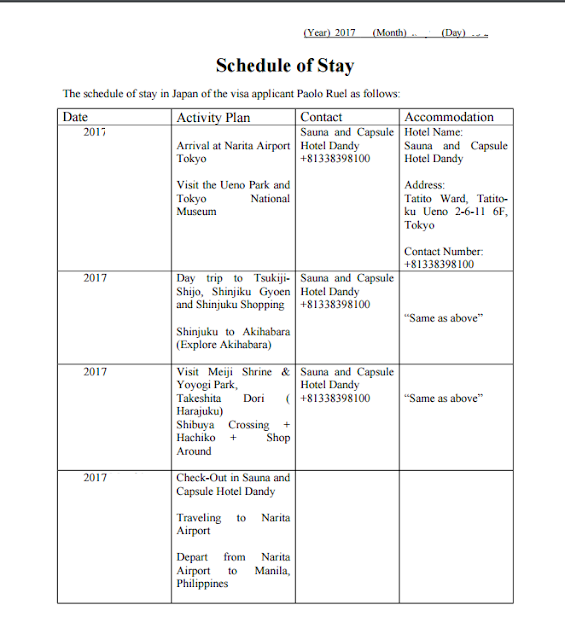 > Schedule of Stay - Sample of my Schedule of Stay see the photo below. > Bank Certificate - I went to the nearest BPI bank to request a Bank certificate. I pay 200 pesos since I have 2 accounts. I think the safest amount is at least 5 digits or depend on your length of stay in Japan. > ITR - Income Tax Return - This is the difficult requirement in part because I don't have one, instead I wrote another explanation letter why I don't have ITR to show. Please see the photo on how I wrote it. So That's it, after verifying my application the agent told me that they will try if the embassy will accept the letter of explanation in my form 137. I pay P950 pesos for handling fee. The application takes only less than 1 hour, but make sure to arrive early to avoid lines. I feel relieved after I filed my application. The only things I do is to pray to get approved. 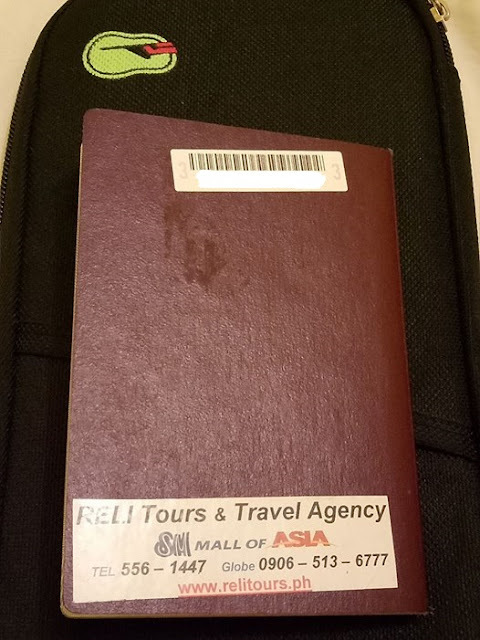 A day after I arrived in Boracay I went to LBC just to buy the prepaid pouch and send it to Reli Tours since I can't pick-up my passport. The agent told me that the application will take 7 to 10 business days to know the result. I prayed harder because it's almost 14 days and there is no result yet. 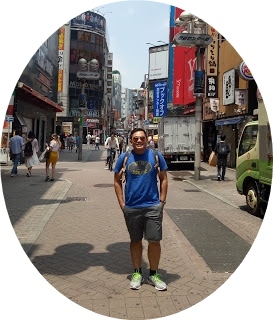 Unexpected day I received a text message from reli tours that my passport is ready for pick-up I called the office and instruct that I already sent a prepaid pouch. The next day I feel restless it is because I am nervous but excited to know the result. I went to Lbc and get my parcel, Before I open it, I promise to myself that I will not hurt whatever the result is. When I open the parcel and I saw already my passport the first thing I look is the back cover and I saw white bar code because if there's a bar code means you get approved. I am so excited to browse the pages of my passport. I can't speak and I can't explain how happy I am to see a Visa on my Passport. Nothing is impossible just pray. As long as complete ang requirements oks nman mag bigay ang japan ng visa... my husband did not have an itr din.. swerte at multiple ang nbigay sa 1st application. Ano po ung mga requirements na pinasa mo maam pag wala kang itr my attachment docs po ba like COE po maam ? How much po kailngan sa bank statement para ma approve? 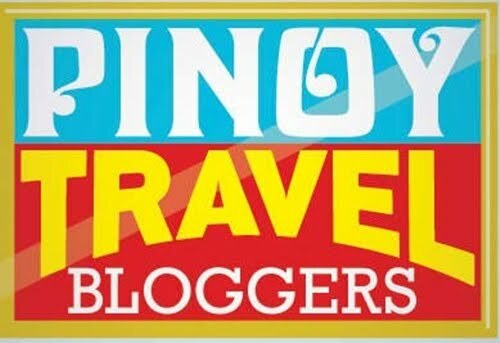 kailngan po mga 50k up for 1 week na? TIA. you had it with your arigatou gousaimashita! Oo nga pala sir... Meron ba sila required amount kung magkano dapat nakalagay sa Bank Certificate mo? Thank you for such a detailed description that helped to understand all the subtleties of this issue. "It must be issued within one year from PSA Main Office/Serbilis Outlet Center(Nationwide)" - may I ask, does this mean I can't use my old Birth Certificate? Kailangan talaga magrequest ng bago? My problem is my BC late registered. That you have no form 137..
Good day Hi anyone here who can answer my question? My friend is an works in a cruise ship outside the country, wala silang tax.. so ano kaya pede pakita? Nakakapag pagawa ba sa BIR ng tax exemption certificate? 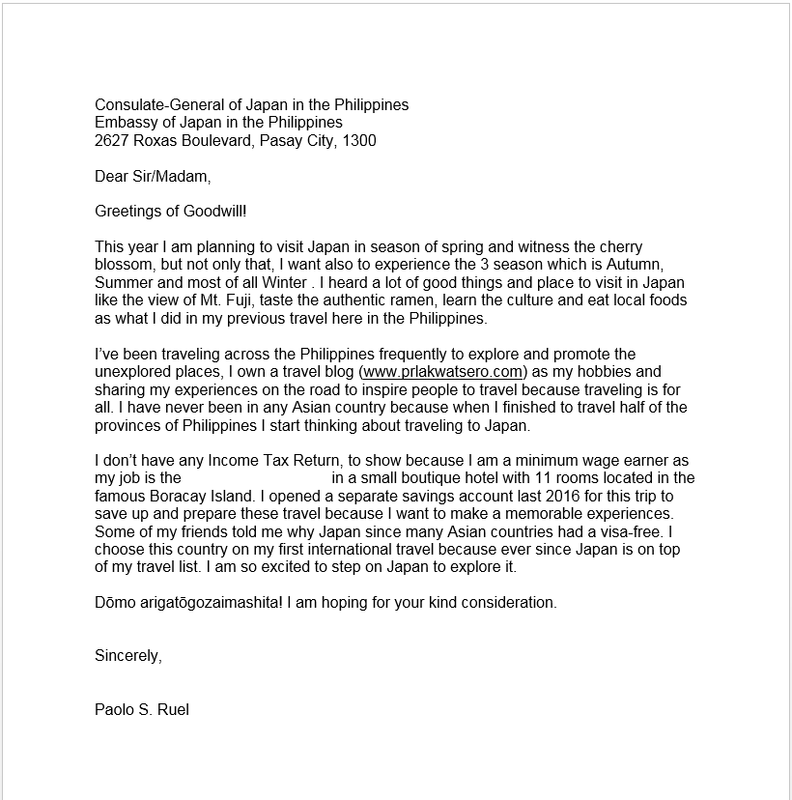 I read somewhere na ganun ang need for OFW for japan visa requirement. Thanks for the reply. Pwede kayang in lieu of the form 137, transcript of record nung college ang ipasa . Hello ask ko lang po kasi may problema ako sa baptismal certificate ko late registered din ako sa birth cert kasi po iba yung last name ko sa baptismal father ko ang last name ko sa baptismal tapos sa birth cert ko sa mother ko paano kaya yun?sa form 137 ba sure ba na kahit sa elementary pwede ipasa?